Flashing headlights meaning is when a driver briefly turns the full main beam lights on from either dipped lights or from no lights at all. This brief flash is used as a method of communicating with another drivers, a cyclist or pedestrian. 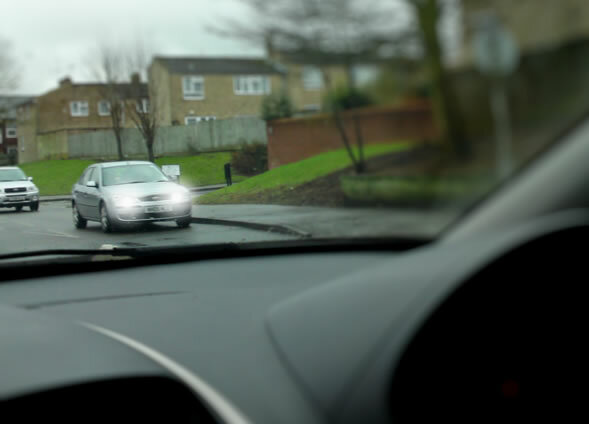 Flashing headlights Can have several meanings from communicating to another vehicle that a police speed trap or cameras is ahead of them, to allow a vehicle, cyclists or pedestrian to proceed usually when they do not have priority, to warn other of hazards or to simply greet a person that you may recognise. Flashing headlights can also be used as a type of aggressive driving. The Highway Code is basically suggesting that a driver may flash their headlights to warn other drivers of their presence if in a hazardous position, or to warn another person that may not have noticed you. Though there’s no specific offence for flashing headlights, depending on the reason, this action can land a motorists in trouble with the law. A motorist flashing another driver to warn of a speed trap ahead is a breach of section 89 of the Police Act 1997 – “obstructing a constable in the execution of his/her duty.” Under this offence, the maximum fine is £1000, though in reality if caught, the fine would be significantly lower. Using your headlights aggressively to intimidate other drivers has the potential landing the driver in court with a prosecution of dangerous driving (3 to 11 penalty points) or furious driving (3 to 9 penalty points) with a fine of up to £5000. Outside of the suggestions made by the Highway Code, the only appropriate situation that calls for a driver to flash their headlights is to warn another driver of a random hazard in the direction they are travelling. Although headlight flashing in itself is potentially hazardous as it redirects a drivers concentration elsewhere, warning a driver of a hazard such as a road accident or flash flood for example, is likely to prove safer and more beneficial. Flashing headlights is all too common and is actually more dangerous than many of us think. There are many scenarios where this can prove dangerous and this is just one example that happens relatively frequently. 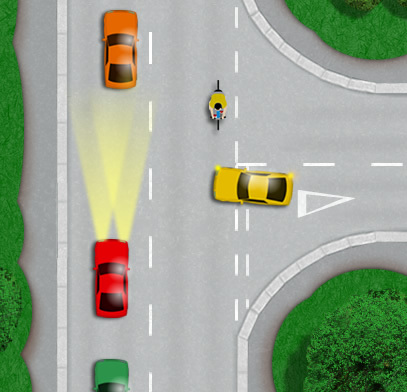 As illustrated in the diagram, the yellow car is waiting to pull out of a T-junction to turn right into a busy road. The red car flashes their headlights to let the driver of the yellow car know that they can proceed. It’s being courteous and polite of the red car to do this, the problem is however, the driver of the yellow car does not want to impede the progress of the red car (or any others) and so makes a hasty exit of the T-junction into position in front of the red car. In the yellow cars speedy exit from the T-junction, they failed to see the cyclist approaching from the right. This situation can apply to flashing a pedestrian to cross the road or at a Zebra crossing, a cyclist to cross the road or exit a junction or many other situations. The problem is that when you flash headlights to signify that someone may proceed, they often react on impulse almost as though they have been given an order. They then take the safety out of their own hands and puts it into the driver who flashed their lights. The correct procedure, if you intend on being courteous and letting someone cross or out of a junction is to slow down (if safe to do so) and allow a large enough gap for them to move into or cross and to not signal to them to proceed at all. They will use their own initiative to take this opportunity and to use the correct observation before proceeding. If you really are a persistent headlight flasher, before spontaneously flashing someone, try to ensure it is safe for them to proceed before flashing. Although it’s not illegal to signal to another driver to proceed by use of headlight flashing or hand gestures, it is not advised to do this during a driving test for the above reasons of being potentially or actually hazardous. Though signalling to a pedestrian or other road user in this manner during a driving test isn’t necessarily a test failure, it really depends on the actual situation and the discretion of the examiner (their personal view on this matter). Ideally, continue driving as normal but if it appears a driver is trying to be pushy and move out in front of you, safely slow down and provide enough room for them to continue without gesturing to them. This situation can happen frequently with learner drivers as they are often slower, plus the mere fact of being a learner, other drivers often want to be in front and not behind them. Outside of the courteous gestures that may involve headlight flashing, if you receive random headlight flashing from other drivers this could signify a problem. You may for instance be driving with full beam headlights on which results in dazzling other road users. check your lights to see if the blue full beam light is illuminated and if so switch to dipped lights. You may have the fog lights turned on when the conditions are not foggy. Again these are very bright and dazzle other road users. It may be getting dark and you have forgotten to put your lights on or a front (or rear if flashed from behind) light may have failed whilst driving at night. Not necessarily. Flashing your headlights should be used (at night) to alert others that you are there, exactly as the highway code states. For example, when you are travelling through a blind tunnel on a bend which only one car can pass through at a time. By flashing your headlights, you warn oncoming traffic that you are there, so that they stop before the entrance to the tunnel and give way to you (as they cannot see you as it is on a bend) Of course, it’s not limited to this. For example, there is a blind mini-roundabout where I live so I flash my headlights on approach to alert others that I am there. The mini roundabout has such a steep curve that you need to stop before the mini roundabout to allow them to enter, as they simply do not have space to manoeuvre if you are stopped at the line. During the day, perhaps the horn should be used instead for the same reason. Of course, the horn can’t be used between 10:30pm and 7am (or something like that) hence why flashing headlights is preferred during the night. If someone flashes their headlights then yes you can carry on, but ensure it is safe to do so. The issue with drivers flashing their headlights is that sometimes the other driver makes an impulsive move without checking it’s actually safe to do it. So as long as you ensure it’s safe, then carry on.